Last update :3rd Nov. Some more work on kit 12. Let me introduce Polly. She is a Polly V 2-6-0 tank loco, in 5" gauge. She is a live steam model, coal fired, and capable of pulling several people. She comes as a fully machined kit, only requiring hand tools to complete. Now let me introduce myself. 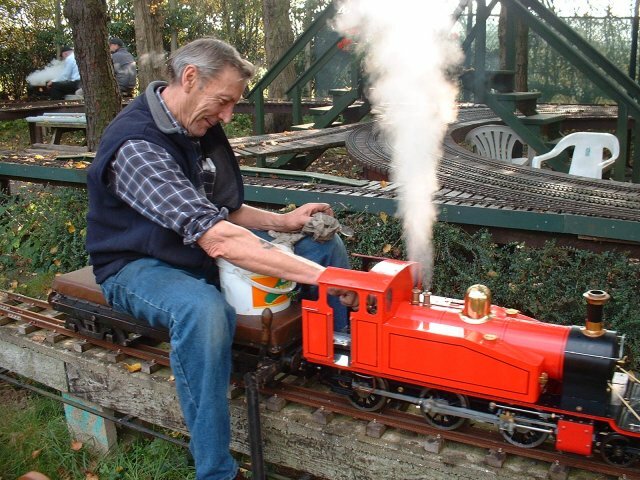 I do a bit of model engineering, and was half way through machining a 5" gauge 0-4-0 narrow gauge tank loco when I got posted out to the Far East for work. I couldn't take my workshop machinery with me, so I went without doing any model engineering for a fair while. However, the need to make something out of metal finally overcame me, so I decided to buy a machined kit as I could build this without machine tools. I looked at several kits available, but eventually decided on the Polly V. It was a nice looking loco which was most important. I had talked to people at various model engineering exhibitions and Polly ME seemed to have a good reputation, which is also important. Having talked to the company, they were happy to get a complete set of parts together and ship them out to China. I used an agent in China to arrange shipping and import which saved a whole lot of hassle, and probably saved me money as well. Polly is supplied in 12 kits. Normally Polly ME supply these in monthly stages, but I got all 12 at once as this was the cheapest way of getting the kit out to China. This does give me the advantage of being able to work ahead. I'm now in South Korea, and being in a foreign country where they don't spend much time on hobbies or do much DIY is going to pose some interesting challenges in trying to get the stuff you'd normally just pop down to Halfords or B&Q for. Before I started in earnest, I loosely assembled the first 4 kits to see if there were any obvious problems. I shall continue to loosely assemble to loco a few kits ahead to see if there are any problems lurking in the wings. This web site is my story about how I am building Polly. I hope you enjoy it. Disclaimer : The information given on this web site is is simply me relating on how I built the kit. It should not be interpreted as instructions or advice. You use the information on this web site entirely at your own risk. I accept no liability whatsoever.